After Health Care Reform Efforts Fail, Republicans Look For Small Bipartisan Victories : Shots - Health News Senate Republicans and Democrats are trying something new on health care. It's called cooperation. Sen. Lamar Alexander, R-Tenn., is working with Patty Murray, D-Wash., on a bill to stabilize the health insurance market. It starts Wednesday when the Senate Health, Education, Labor and Pensions Committee holds the first of four hearings over two weeks with the goal of passing a modest bill to help stabilize the Obamacare health insurance markets for 2018. 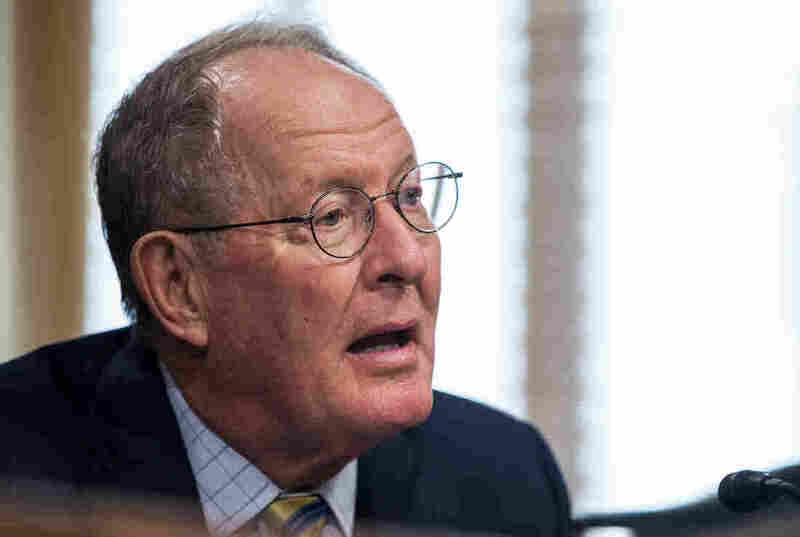 Committee Chairman Lamar Alexander, R-Tenn., says he's looking to do something "small, bipartisan and balanced." What's remarkable is that he made that statement in a joint press release last month with the committee's ranking Democrat, Sen. Patty Murray, D-Wash.
Up until recently, all major Republican efforts to alter Obamacare were launched with no Democratic support, and no attempts to get any. Alexander and Murray say they want to work first to stabilize the markets for next year and then perhaps move on to broad reforms that will attract more insurance companies to compete in the individual markets, potentially making prices lower for consumers. They've got a short window. Insurance companies have until Sept. 27 to sign contracts committing them to offering health plans on the Affordable Care Act exchanges next year, and setting their prices. Alexander says his priorities include getting Congress to commit to funding so-called cost-sharing subsidies — payments that reimburse insurance companies for giving their lowest-income customers discounts on deductibles and co-payments. President Trump has threatened to end the payments and has refused to even say whether the government will make them for the final four months of this year. "State insurance commissioners have warned that abrupt cancellation of cost-sharing subsidies would cause premiums, copays and deductibles to increase and more insurance companies to leave the markets in 2018," Alexander said in a statement last month. "Congress now should pass balanced, bipartisan, limited legislation in September that will fund cost-sharing payments for 2018." He also wants the federal government to make it easier for states to get waivers so they can implement health policies that differ from Obamacare. Wednesday's hearing will feature insurance commissioners from four states, including Julie Mix McPeak from Alexander's home state of Tennessee. She's called for assurances that the payments will continue. "When there's any uncertainty surrounding the continuation of those payments, the insurers are doing two things. They are raising premium rates for 2018 and they're making decisions about whether or not to participate in the individual exchange markets across the nation," McPeak told NPR's Ari Shapiro in August. On Thursday, governors from four states will testify. They include John Hickenlooper of Colorado, who together with Gov. John Kasich of Ohio recently proposed their own bipartisan plan to overhaul the insurance markets. Their plan includes creating a two-year reinsurance fund to protect insurers from people who have severe illnesses and make big claims. It would also exempt insurance companies from certain taxes if they enter a market in which there's little to no competition. The governors' plan also advocates maintaining the so-called individual mandate, which requires everyone to own health coverage or pay a fine. That mandate is one of the most hated elements of Obamacare among Republicans and President Trump has suggested that his administration will make little effort to enforce it. Hickenlooper and Kasich laid out their plan last week in a letter to congressional leaders that was signed by the Republican and Democratic governors of eight states, including Gov. Brian Sandoval of Nevada. By signing on to this proposal, Sandoval, a popular Republican, seems to be indicating he will not support the new health plan proposed by his fellow Nevadan, Sen. Dean Heller. Throughout the late spring and summer, insurance companies filed plans with the federal government that included proposed premiums for the health insurance plans they intend to offer in 2018. Many said they were raising rates because they weren't certain the Trump administration would enforce the individual mandate or pay the cost-sharing subsidies. An analysis by the consulting firm Oliver Wyman suggests that by taking action to stabilize the market, lawmakers could boost enrollment by 2 million people while cutting prices. HELP isn't the only Senate committee pursuing the bipartisan approach. Finance Committee leaders Orrin Hatch, R-Utah, and Ron Wyden, D-Ore., are planning two hearings in the next two weeks on insurance markets and the Children's Health Insurance Program. A previous version of this story said that insurance companies weren't certain the Obama administration would enforce the individual mandate or pay cost-sharing subsidies. It should have said Trump administration.